Henry Conquer Flindell was born in Bridgewater, Somerset, England on March 3rd 1852. He was the seventh child of Francis Bassett Shenstone Flindell and Joanna Elizabeth Northam. At the time the family was living at Emily Cottage Wembdon , Somerset, which is near Bridgewater. A record of his baptism has not been found, but it would be consistent with the family for him have been baptised in Wembdon, possibly at St George’s Anglican Church. 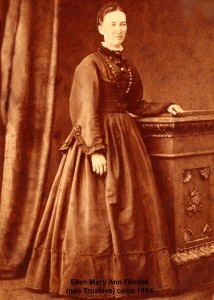 Henry’s baby sister Elizabeth was born in Bridgewater in 1854, shortly after which the family moved to London. The Flindell family sailed from Plymouth on September 23rd 1857 aboard the “Nile”, bound for the Swan River Colony. On January 1st 1858, two months short of Henry’s sixth birthday, they arrived in Fremantle. Henry’s schooling would have been continued informally on the trip out. It is possible his older sister Ann, who became a teacher in the Colony, taught Henry and other children during the voyage. This would have been as much to keep him out of mischief as to educate. But this was also a time of play and making friends. 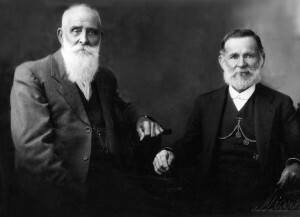 For Henry it was the beginning of a lifelong friendship with William Hale (Henry left, William right). His colonial education began in Perth where his father continued as a warder until 1860 when he transferred to the Government Printing Office. Three years later his father again transferred, this time to the Customs Service as a Tidewaiter in Fremantle where Henry’s education was conducted at Fremantle Boys School. By mutual agreement young Henry left school early. There is a story about an “Irish” master, whom it seems lacked both a sense of humour and tolerance of the young. George Humble became headmaster in 1868, but names like Ralston, Jose and Clancy filled positions as either a monitor or student teacher. Who conducted such punishment without fear or favour, fervently and frequently has not been named. It seems the practice was to drape the recalcitrant over the back of a student who would move between prefects to strike the victim. Whether deserved or not, this became too much for Henry, a large lad who was in fact a gentle soul. The final act played out with Henry storming out with his books, having repaid his tormentor with the contents of his inkbottle. This became known as the inkbottle salute. Henry continued his education elsewhere. In his younger post-school years, Henry Conquer took up droving in the southern districts of Western Australia. He may have been influenced by his brother Thomas Shenstone who moved to Kojonup in 1860. Sandalwood was by this time a valuable export for the Colony. In his late teens Henry moved into harvesting sandalwood and drove his team in the Narrogin district gathering the precious wood. Henry married in 1877. His occupation, as inscribed on the marriage certificate, was that of Cattle Station Manager at “The Serpentine”[i]. Clearly Henry had by then proven farming and management skills to have progressed to this level of responsibility. How long he stayed in this position is not clear, but by 1881 he was listed in the Almanac as a Farmer at Wanneroo (Joondalup). He was still there in 1884. This may well have been on his father-in-laws land noting that in 1878 John Gibbs Truslove was granted 100 acres (40 hectares) located about 20 miles (31 km) north of Perth. By 1886 Henry was working in the North West of WesternAustralia as a teamster, and spent a year in the Ashburton district. He developed contacts and carted wool to ports at Onslow and Maud’s Landing, returning with supplies for the stations. During this time he became friendly with David (Mardie) Simpson. Henry was carting wool for Simpson from “Kooline” Station to Onslow, a 30 day trip of about 260 kilometres as the crow flies. On his return he was told “Mardie” had died and was buried in an unmarked grave at his old camp located on the Ashburton River near Mount Mortimer. Henry, a man brought up with strong Christian principles, did not want the grave lost. While searching for an appropriate piece of stone he found a collection of native art that he described as “rude conceptions of goannas and other small species” carved in the slate. 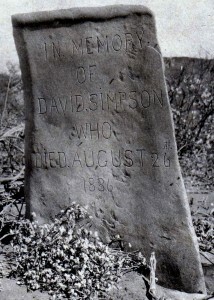 He selected a large flat piece of slate and carved Mardie’s headstone with his penknife – “IN MEMORY OF DAVID SIMPSON WHO DIED AUGUST 25th 1886″. On the bottom left hand corner he carved “H. Flindell”. On May 23rd, 1877 Henry Conquer and Ellen Mary Ann Eliza Truslove rode on horseback from Gingin to Wanneroo to be married. Ellen was the daughter John Gibbs and Charlotte Hannah (nee Gee). Their Certificate of Marriage states they were married at the Government Schoolroom Wanneroo, used also as a place of public worship. The fathers were noted as Francis. B. S Flindell, Printer and John G. Truslove, Farmer. The marriage was celebrated by Joseph Gregg, Dean of Perth. The witnesses were Henry Gibbs and Thomas S. Darch. This was the first day of a long and loving marriage. Ellen was an accomplished horsewoman and as a girl frequently rode from Wanneroo to visit her relatives at Gingin Brook. Her Uncle Joseph Gee and his wife Elizabeth settled in Gingin in the early 1860’s. Church records of baptisms point to other family members in the district. But what is the connection with Henry? The only tenuous link I can see is that “The Serpentine” managed by Henry may have been in the Gingin area, but that has not been validated. The other possibility is that Ellen and Henry met in Fremantle as children. The most important fact for direct descendants is that they did meet. Ellen and her siblings, like their parents, were illiterate. At the age of 12 her mother sent her to Fremantle to work with Mrs. Cooper, who had been a school teacher. Ellen was keen to get an education and Mrs. Cooper was an understanding lady and they struck a deal that satisfied them both. Ellen worked as a servant during the day and the lady of the house tutored heart night. Albert Edward born in Perth in January 1885 and died age two months. Walter Richard born at Fremantle October 27th 1893 and died at Fremantle February 5th 1968. That Ellen and Henry’s first child was stillborn and five of the remaining ten children did not survive their first year, it will not come as a surprise that Ellen demanded they move to a more civilised environment. In 1887 Henry took a position with the State Government on the “outside staff” of the Customs Office at Fremantle. Following Federation in 1901, he was transferred to the Commonwealth Customs Service. Initially they lived in Russell Street, South Fremantle, but by 1895 they were in the home that Henry built on the corner of Samson and Edmund Streets, Beaconsfield. For the greater part of his Customs service he was employed as a warehouse locker, no job for a weakling when one consider the size and weight of the locks used at that time. It may be hard for families who in those days owned a horse and buggy, or today owned a MPV, but Henry and Ellen had neither. Bessie Hansen (1910-2008) has been both an inspiration and source of information for me. She talked about the number of children Ellen and Henry had and what a wonderful person her grandma was. She told the story that when her grandma wanted to visit someone she would start off with the baby, and then go back for each of the children to make the visit. The return journey was similarly conducted. Henry retired in 1913, which gave him more time for his great passions. He was an active member of the Horticultural Society, taking out First Prize in the 1910 Cottage and Garden Competition for which he was presented with a handsome mantle clock that is still in the old home. He was a member of the Historical Society of Western Australia. He and his wife were inaugural and lifelong members of St Paul’s Anglican Church, Beaconsfield – he serving as a church warden and she as founding member and office bearer of the Mother’s Union. His other passion was writing letters to the editor, frequently in conjunction with his daughter-in-laws mother, Clara Ulrich. The two families shared a warm relationship and Clara and Henry frequently involved themselves in discussions on topical issues, which no doubt they shared with the Editor. Today we may be surprised that although Henry and Clara were great friends, bonded by the marriage or their respective children and the closeness of their homes, they always addressed each other as Mrs. Ulrich and Mr. Flindell. Indeed, in all respects Henry conducted himself as a Gentleman and Ellen a tall, elegant Lady. This was widely recognised within the community in which they lived and participated. St Paul’s church archives have a photo of their golden wedding anniversary and their daughter Ethel and friend Mrs. Currie made a banner in memory of her. Henry and Ellen Mary celebrated their Golden Wedding Anniversary at their home in Samson Street, Beaconsfield on May 25th 1927. This joyous occasion was reported in the local newspapers accompanied by a 10cm by 10cm photograph of the happy couple. The occasion was also celebrated by their spiritual home, St Paul’s Anglican Church, Beaconsfield. It is not known whether or not they had a wedding cake on the day of their marriage. If, as is likely, they did not , the two-tier decorated cake prepared for this celebration would have reminded them of their ride from Gingin to Wanneroo school fifty years earlier. No doubt as they reflected on the highlights of those fifty years they were also saddened by the six children who were not with them. Ellen passed away before Henry. She died at home on August 24th 1832 after several weeks of illness. Henry wore his loss deeply and, it was said, didn’t fully recover in spirit or the will to live. The “Boatman” came for Henry on June 21st 1934 at their home in Samson Street. Both were interred at Fremantle Cemetery in the Anglican area, section AA, grave 424. In death as in life, Henry and Ellen’s resting place is close to Joseph and Clara Ulrich who died in November of the same year and buried in plot 551. The late Mrs. Ellen Mary Flindell of 67 Samson Street, Beaconsfield, wife of Mr. Henry C. Flindell, who was for many years with H.M. Customs at Fremantle, was born in Perth 78 years ago, and was the daughter of Mrs. Charlotte Truslove who was born at Bassendean in 1833 and was one of the first white women to be born in Western Australia. Mrs. Flindell spent a life devoted to church work. She was a member of St Paul’s Beaconsfield, for about 40 years, and a past president and foundation member of the Mothers’ Union. During the Great War she did considerable work through the Red Cross Society. Her lovable disposition won her the affection of a wide circle of friends, she being one who was ever ready to help others in case of need. The funeral took place yesterday morning. A service was held at St Paul’s Church, Beaconsfield, at which Rev. E.S. Bartlett officiated. The Rev. Canon A.L. Marshall also took part in the service, at which a very large gathering was present. At the graveside in Fremantle Cemetery the Rev. Bartlett also officiated. After 78 years residence in Western Australia, Mrs. Ellen Mary Ann Flindell, the wife of Mr. Henry C. Flindell, of 67 Samson Street, Beaconsfield, died at her home yesterday after several weeks of illness. The late Mrs. Flindell and her husband, another of the State’s pioneers, had a family of eleven, of whom two sons and two daughters are living. Mrs. Flindell’s grandparents came out in the ship Caroline in 1830 and she was born in a little stone house at the foot of Mount Eliza overlooking the Narrows. Her father Henry (sic) Truslove was a contractor in Perth and, when she was a girl, he accepted a contract to saw wood for the Barracks in Perth. For that work he took up a concession at Wanneroo, where Mrs. Flindell spent much of her girlhood. Her uncle lived at Gingin Brook and she often used to visit him, making the lonely ride from Wanneroo to Gingin Brook by way of Yanchep. At the age of 22 she married, and, when her husband was appointed to a position with His Majesty’s Customs at Fremantle, they took up residence at Fremantle where her quiet disposition and readiness to assist those less favoured than herself earned for her a wide circle of friends. One of her most cherished possessions was a washstand set brought from England to the State by her grandparents in 1830. An old resident of Western Australia and an authority on the early history of Fremantle, Mr. Henry Conquer Flindell, died at his home in Beaconsfield on Thursday. Mr. Flindell was born in Somersetshire in 1852, and came to Western Australia as a boy of six years, on the Windjammer Nile. Of those who arrived by that ship, he has been for many years the sole survivor. His father, Mr. F.B. Shenstone Flindell, played an important part in the development of the State. He was generally credited with having been responsible, by his agitation, for the construction of the first railway in Western Australia, and was the founder of the West Australian Agricultural Society. Mr. H.C. Flindell spent some years in the Narrogin district, where he drove a team on trips for gathering sandalwood. Later he worked as a drover in the North-West. In 1887 he entered the service of the State Government on the outside staff of the Customs Office at Fremantle, and in 1901 he was transferred to the Commonwealth service. For the greater part of his period of service with the department he was employed as a warehouse locker. He retired in 1913. He was a big well-built man, rather serious and inclined to be reserved with his fellow employees, but he was highly respected. He had an excellent memory and a passion for accuracy, which enabled him to settle many disputed points about the early history of Fremantle, on which he was a recognised authority. When “The History of Fremantle” was written during the Centenary year, Mr. Flindell assisted Mr. H.J. Hitchcock in the compiling of his information. He had kept thorough records of the ships which visited Fremantle in the early years and was regarded as an authority on the colonists who arrived during the fifties and sixties, particulars of whom he had obtained from his father. He wrote many articles for newspapers on the subjects of which he was qualified to speak, generally to give accurate information on controversial questions regarding Fremantle. He was a member of the Western Australian Historical Society. Apart from Mr. Flindell’s interest in history, his principal occupation since his retirement was the growing of flowers, and until his illness prevented him, only six months ago, he spent many hours in his garden. He married Miss Ellen Truslove, a member of another family associated with the early history of the State. His wife died about three years ago. He is survived by two sons and two daughters. They first lived at Butler’s Farm in Melville and later Major W. Nairn employed John to work for on his property on the banks of the Canning River. 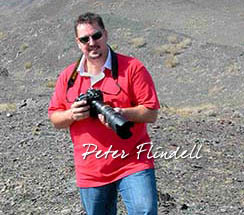 John died in Wanneroo from a gun accident. His death certificate 244 of 1846 gives age at death as 56 giving his year of birth as 1790, three years earlier than the Swan River Pioneer Group Records. Burials at Skinner Street Cemetery record death of John Truslove in 1846, age 56, father John Truslove – there is a “father’s name” conflict, but all other details agree. It is possible that Rebecca married William Taylor in Perth in 1854. If this is correct she would have been aged 53 years when she remarried and 64 years when she died in 1865. The Henty brothers chartered the ‘Caroline’ under the command of Captain Fewson to take contracted workers and their families to Fremantle. James Henty was in charge of the 66 passengers and live stock on the journey. Charles Gee was to work for them for five years as a carpenter at £20 per annum. The “Caroline” sailed from West Tarring on June 2nd 1829 bound for the Swan River Colony, arriving at Fremantle 12 Oct 1829. Mary Gee gave birth to George (1829-1831) during the voyage. It is not known when Mary died, but after her death the family moved to the Swan region past Guildford. In 1842, John Truslove Junior was taken before R. McB. Brown, Esquire in the Fremantle Magistrates Court charged with shooting a licensed pointer dog, the property of Mr. J. Okely of Perth. It appeared in evidence that the dog had stolen some meat from the defendant’s father’s house, and that he had shot the dog on the premises. It was not done maliciously, as the defendant thought the dog belonged to the natives. The complaint was withdrawn on defendant paying costs. This public exposure both sets the scene of family and Colony life, and is a commentary on the status of aborigines in the eyes of the Colonial power and public generally. George (1850-1918), married Margaret Buckley (1851-1874) at Greenough in 1874. John Alexander (1852-1924), married Mary Strickland (1855-1877) at Irwin River in 1873. In 1888 he married Eliza Emily Fripp (1869-1942) at Geraldton. Ellen Mary Ann (1854-1932), married Henry Conquer Flindell (1852-1934) at Wanneroo in 1877. Joseph Cornelius (1856-1889), married Eliza Hunt (1857-?) at Irwin River in 1876. Charles Thomas (1858-1938), married Jane Simpson (1860-1934) at Middle Swan in 1883. 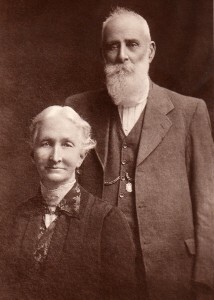 Henry (1859-1893), married Sarah Brown (1865-1957) at Gingin in 1883. Edward (1861-1947), married Janet Bruce (1861-1947) at Roebourne in 1903. Charlotte (1864-????) married John Cockman at Middle Swan in 1883. Walter Richard (1866-1946) married his brother Henry’s Widow Sarah at Perth in 1895. Alice Rebecca (1876-1960) married Ferdinand Charles Farrall (1868-1936) at Midland in 1892. I JOHN TRUSLOVE, farmer, married; now residing at Wanneroo, in the district of Perth, do hereby give notice that it is my intention to apply at the next quarterly Licensing Meeting to be holden for this district, for a license for the sale of Wine, Beer, and other fermented liquors, the products of the colony, in the house and appurtenances in which I reside at present, situate 19 miles from Perth, on the Great North Road, in Wanneroo, and which I purpose to keep as an inn for the entertainment of travellers. The house has a sitting room and two bed-rooms, besides those that are required for my own family. There is a stockyard for bullocks, and sufficient stabling. I am the owner of the property, and I have not hitherto held a license of any sort. a Wayside House License for the sale of Fermented and Spirituous Liquors, in the house and appurtenances thereunto belonging, situated at Wanneroo, containing five rooms altogether, two of which are used by my family, my own property, and occupied by me, licensed under the sign of the ” Travellers Rest” and which I intend to keep as an Inn or Public House. I am at present licensed to sell wine and beer of colonial production. John was a busy man, who by now was prominent in society, at least in Wanneroo. The Western Australian Times of December 20th 1878 reported that John was not only the Clerk of the Course for the Wanneroo Races, but also his horse won the first and second heats of the Wanneroo maiden Plate the prize money for which was £10. Another of his horses won the Hack Race. In 1878 John Gibbs was awarded a contract to supply saw timber for the Barracks being built at the top of St. Georges Terrace, of which only the historically listed main entrance survives. He was granted 100acres of land (Location 618) at Wanneroo where he built a saw pit to cut local jarrah. This is somewhat surprising, albeit entrepreneurial given his other activities. This property must have been adjacent to his other land as it was also 19 miles from Perth. I JOHN TRUSLOVE, now residing at the ” Bush Inn,” Gingin Road, in the District of the Swan, do hereby give notice that it is my intention to apply at the next Licensing Meeting to be holden for this district, for a Wayside House License for the sale of fermented and spirituous liquors, in the house and appurtenances thereunto belonging, situated at the Upper Swan, Gingin road, containing one sitting room, two bed rooms, and several other rooms, known as the ” Bush Inn” rented from Mr. W. D. Moore, and which I intend to keep as an Inn or Public House. I have held a license about one year. Given under my hand this 25th day of November, one thousand eight hundred and seventy nine. John died at Wanneroo in 1908 and Charlotte at Midland in 1916. They are buried in the same grave at Midland Cemetery in the Salvation Army section. For those with knowledge of the geography of Perth, the property would have been just north of the City of Joondalup and Lake Joondalup and south of Flynn Drive Neerabup. It was largely to the east of what is now Wanneroo Road and would have taken in Carramar Golf Course and Residential Estate. Point Maud is just north of Coral Bay. Simpson and his partner Malcolm MacIntosh established Mardie Station on the lower reaches of the Fortescue River and this is why he became known as “Mardie”. Simpson moved to the Ashburton in 1883 and leased Kooline Station. In 2002 Laura Shannan, Post Mistress at Onslow, wrote to Bessie Hansen, granddaughter of Henry Conquer Flindell, about Simpson’s tombstone and death. She stated “I have heard two stories regarding David Simpson’s death – one that natives kept him away from the river and he died of thirst and the other that he went on a “bender” after months of abstinence and the excessive intake of alcohol caused his death”. Researching this at the Roebourne Library evidence was sighted that he had been on a “bender” and committed suicide by shooting himself. Roebourne policeman Charles Payne investigated the death and submitted case report 1886/245 on his return. This would be a distance of 30 miles or 50km via Yanchep. Joseph Gee owned Swan Location 401 granted to him on December 19th 1867. Their property “Woodloes” was near the junction of Gingin Brook and Moore River. They had ten children born between 1854 and 1866. Source – Bessie Hansen (nee Flindell), who was very close to her grandmother. She had other stories, some mentioned here. This house has remained within the family and is now owned and lovingly maintain by Carol Rourke, their great granddaughter. It is not a surprise that Bessie was close to her Grandmother Ellen. Bessie was tall, slim and quietly disposed like Ellen. As Bessie was required, on completion of her schooling, to stay at home and help her mother, she had time during the day to walk 4 houses away and soak up all she was told. The Boatman crosses the river to Hades, the abode of the dead, to take them from this world to the other side. This is more than an expression in the family for those nearing death; particularly for the older generations, it seems to be a vision or experience. While descendants have long held this to be true, it is not. The set was brought out by her maternal grandparents. The “Caroline” arrived in 1829. Her father, John Gibbs Truslove arrived in 1830. The “ironstone” washstand set, which comprised a jug and basin, was decorated in blue. It was presented to the Western Australian Museum. The West Australian of June 25th 1934. This should read for the construction of the Fremantle to Guildford and Eastern Districts Railway. The first was privately funded to move logs to Geographe Bay. The first government funded line was between Geraldton and Northampton and construction began in 1874 and took five years to complete. Swan River Pioneer Group Records. LDS records that are not validated record his father was Henry Truslove. Justice Department Records – Marriage Certificate 613 of 1854. Justice Department Records – Death Certificate 2828 of 1865. This is about 31 kilometres. The birth in Fremantle of Ethel Louise in April 1888 is the first of their children registered outside the districts of Guildford or Upper Swan. Also we know Henry Conquer was farming in Wanneroo at a property call “Joondalup” – Almanacs 1881 – 1884. We can assume that Henry Conquer was managing The Serpentine before he married Ellen Mary which could explain why they rode from Gingin to Wanneroo to get married in May 1877. Their first child, stillborn in 1878, was registered in Guildford. Of the twins born in 1880, one unnamed lived one day and Ellen, baptised on February 23rd lived two days. Both births were registered in Upper Swan and deaths in Guildford. The birth of Francis Bassett Shenstone II at Bullsbrook in May 1879 narrows the area. He was born at the “Bush Inn”, which later became known as Warren’s “Ye Olde Bush Inn”, about 8 kilometres south of the present Bullsbrook Hotel. As noted above, Ellen’s parents were at that time resident at the Bush Inn and her first child being stillborn; no doubt the support of her mother, experienced in birth, would have been reassuring. While accepting Registration Districts can be ambiguous as to the location of The Serpentine, the Bush Inn and Warren’s Inn is more definitive. As stated Ellen Mary would have been concerned for the second child she would have wanted competent help. It is reasonable to assume that The Serpentine was within an hour by horse and cart, say within 10 to 15 kilometres on the Bush Inn.